Source: the Toronto Sun, November 4, 1980. By November 1980, Jack Cole had gotten used to hearing every imaginable criticism from the literary community regarding his merchandising techniques during his five decades in the book business. Sure, his Coles book stores may have employed too garish a colour scheme. Perhaps a few branches were staffed by clerks who knew less about books than their clientele. 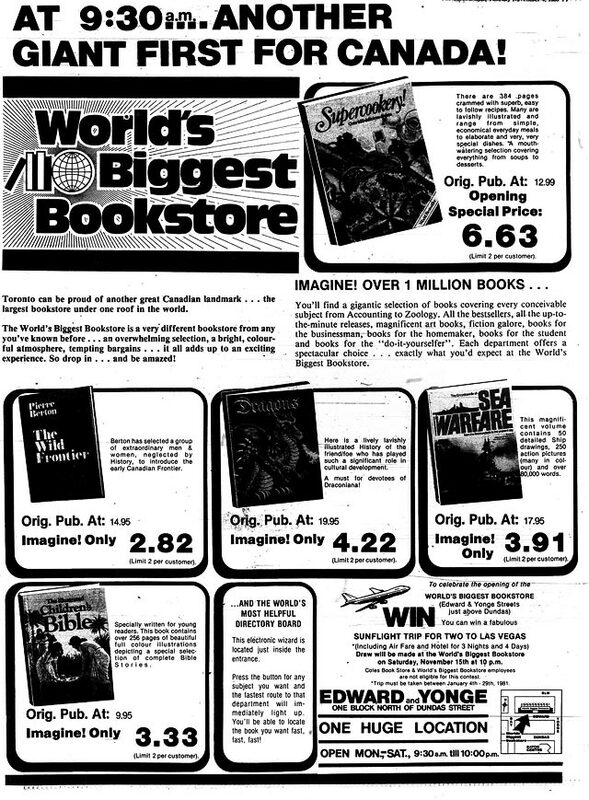 Possibly Pierre Berton had a point when he called Cole “a sharp merchandiser whose only interest is to make the largest profit possible for himself.” Despite the criticism, Cole endured with supermarket-inspired tactics like selling books for twenty-nine cents a pound. His efforts to sell printed matter to a broad audience led his company to grow from a remainder shop on Bloor Street—opened with his brother while Cole was still in his teens—to a chain consisting of over two hundred branches across North America. Cole stayed on after selling the company to Southam Press in 1976, and was the main corporate figure in the spotlight when Coles decided to launch what he hoped would become the CN Tower of local bookstores. Inhabiting the former home of the Olympia bowling alley on Edward Street (the last set of lanes downtown until The Ballroom opens next month), Cole proceeded to create a seventy-thousand-square-foot bookstore which contained seventeen miles of shelving to house a million books divided among one hundred thousand titles. The store would be bathed in bright colours and contain enough lighting that, Cole hoped, it would never be necessary to turn on the heat (a situation already in effect at the Yonge and Charles Coles). An electronic map was installed, inspired by one Cole had seen in the Paris Métro, employing an array of lights to point customers toward the section they were looking for. 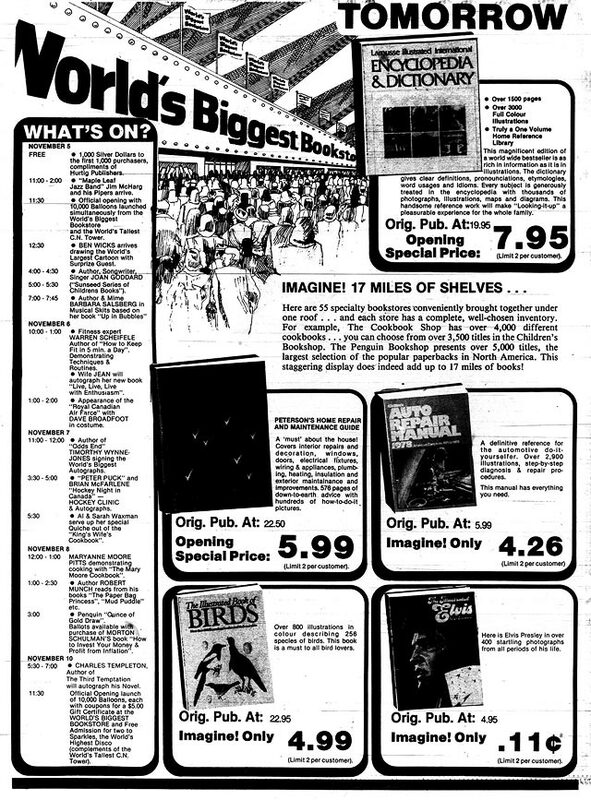 Rather than label the store as just another Coles, the company bestowed upon it a modest name: World’s Biggest Bookstore. Whether it really was that was debated in various ways—even Cole admitted it probably wasn’t the record setter, but he figured it was at least in the top five in the world in terms of selection. When the doors opened on November 5, 1980, the first thousand customers were given silver dollars courtesy of Hurtig Publishers. Four days of festivities followed, which included numerous giveaways and entertainment ranging from clowns to a jazz band. Globe and Mail writer William French suspected that “during lulls in the din, the ghostly echo of crashing 10-pins and the muted curses of pool hustlers could distinctly be heard as the building’s previous tenants protested the invasion of culture.” French also noted that “outside, the store is trendily done in the Toronto architecture style known as Honest Ed’s; inside, the influence is more Dominion store,” and that the lighting was bright enough “to permit a surgeon to perform a cornea transplant right in the aisle, if he weren’t too distracted by the rippling red neon and flashing white bulbs that frame some of the display stands.” Despite his reservations, which included a sense that book lovers who preferred quieter, more atmospheric independent stores would feel that World’s Biggest lacked “a certain element of breeding and class,” French was impressed with the range of titles and the organization of the store. As customers poured into World’s Biggest Bookstore on opening day, nearby Coles locations resembled ghost towns. While lunchtime saw lineups ten deep at the half-dozen cash registers at the new store, The Star found just four customers at the branch on the southeast corner of Yonge and Dundas. The staff didn’t mind the quiet—as the assistant manager admitted, “It certainly gives us a chance to collect our wits.” Coles management planned to convert Yonge-Dundas into a specialty shop for business, technical, and academic books, while a branch in the Eaton Centre would continue to serve shoppers who never left the shopping centre. UPDATE: November 25, 2013, 11:55 AM And now we know that the World’s Biggest Bookstore has been bought by a developer and will be closing in February. Additional material from the October 1980 issue of Quill and Quire and the following newspapers: the November 11, 1980 edition of the Globe and Mail; and the October 19, 1980 and November 6, 1980 editions of the Toronto Star.